Starting at 315 sq. 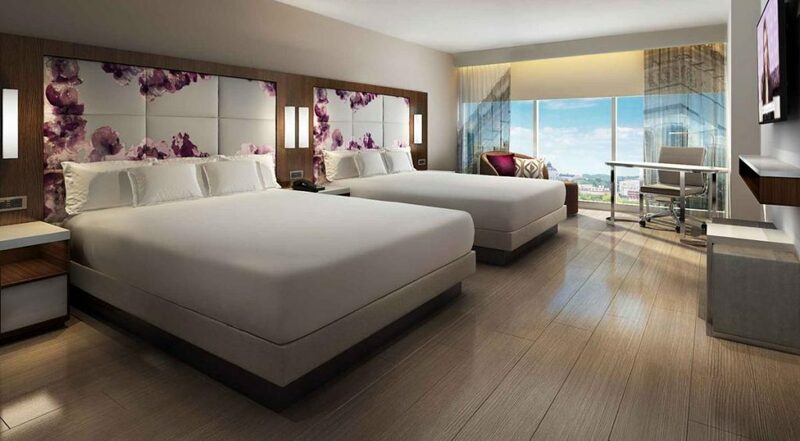 ft. each contemporary guest room features floor-to-ceiling windows, plank flooring, and one or two king platform beds. 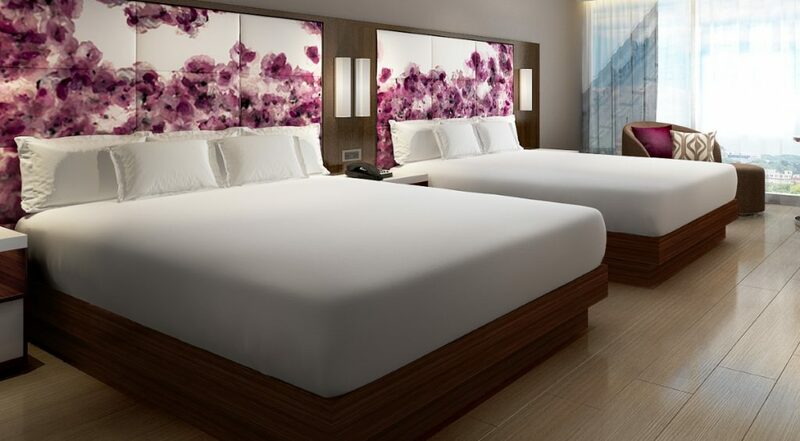 Along with signature Hilton Serenity bedding, you’ll enjoy fast WiFi, a 65-inch HDTV, premium cable, a mini-fridge, Keurig coffee maker, large desk, a laptop-sized safe, and a porcelain bathroom with deluxe bath products. Starting at 332 sq. 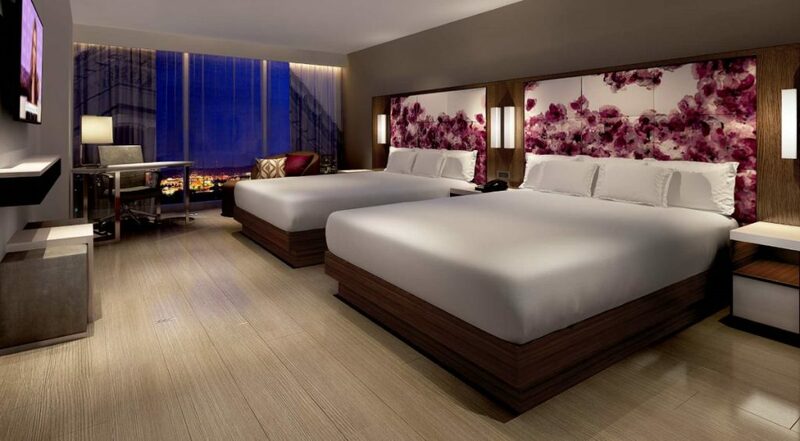 ft., each ultra-modern executive room features floor-to-ceiling windows, plank flooring, and one or two king platform beds. Along with all the amenities of our guest rooms, executive rooms also include access to the Executive Lounge, offering concierge services as well as complimentary continental breakfast and evening hors d’oeuvres each day. Starting at 312 sq. ft., each accessible room features floor-to-ceiling windows, plank flooring, and one or two king beds. 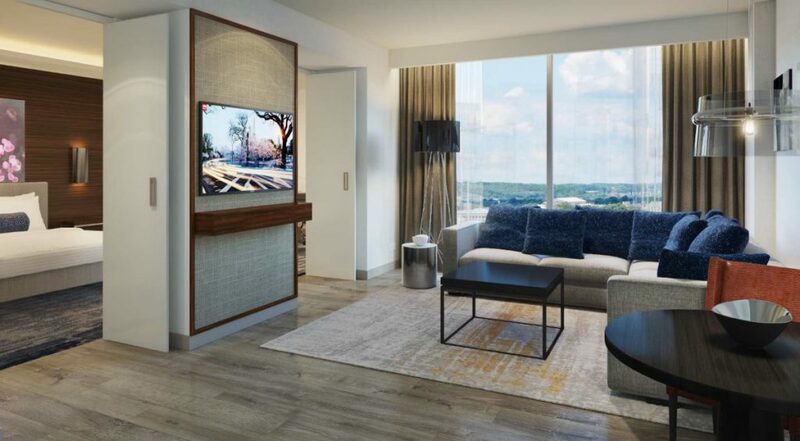 Along with signature Hilton Serenity bedding, you’ll enjoy fast WiFi, a 65-inch HDTV, premium cable, a mini-fridge, Keurig coffee maker, large desk, a laptop-sized safe, audio/strobe alerts, and a porcelain bathroom with deluxe bath products and an accessible tub or roll-in shower.